Join Master Gardeners. Teach gardening in your community. The Master Gardener program is a volunteer organization with the University of Illinois Extension that gives back to the community through gardening and horticulture education. The newest project came about one year ago at the Flanagan Public Library with an idea for a pollinator garden and a new avenue to educate the community. The library had recently renovated the old bank, and the landscaping where the drive-thru window used to be was becoming an over-grown, weedy eyesore. Library board trustees approached two local Master Gardeners about installing a garden in the area. 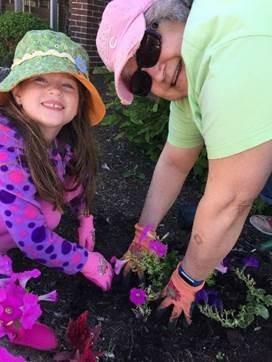 With the help from the local high school horticulture class, a 4-H club, library board trustees and community volunteers, Master Gardeners were able to install a beautiful native plant garden that has been attracting a plethora of new pollinators to the town. Illinois native plants in the pollinator garden include milkweeds, blue wild indigo, prairie blazing star, red twig dogwood, and more. Funds to purchase plants were received from two grants, including the Wild One's Forever Wild grant program and the Illinois Master Gardener mini-grant program. The garden is a Certified Monarch Waystation and Pollinator Pocket. The garden has been an inspiration and tool for the delivery of several new educational programs at the library, including insect hotels and pollinator scavenger hunts. An educational display was also set up in the lobby to further educate visitors about the importance of native plants and pollinators. At the end of summer, seeds were harvested from the native plants by the high school horticulture class, who plan to in turn grow the plants in their greenhouse for their spring plant sale and encourage others to plant native plants in their garden. The idea for a 338 square foot garden has had such a positive impact on the village of Flanagan's population of 1,100. More native plants are being planted, there is an increased awareness of the importance of pollinators, and there has been a great display of community pride and ownership of the garden. This project is only one example of the many ways that Master Gardeners "Help Others Learn to Grow" throughout Livingston County. The Master Gardeners currently have seven community and Junior Master Gardener projects in the county. University of Illinois Extension will be hosting Master Gardener volunteer training in Pontiac this fall. Join us for 11 sessions to learn about all things horticulture- trees, vegetables, insects, flowers, and more! Training will be every Thursday from 9 a.m. to 4 p.m. starting August 23 through November 8. The cost of the training, including the Master Gardener training manual and all classes, is $225. Financial assistance may be available to qualified individuals. Once training is complete, Master Gardener Interns make an impact on their community by completing a required 60-hour internship through approved volunteer services, which includes participating in gardening projects, attending local meetings, answering gardening questions in the Extension office, or giving demonstrations or talks to local groups, and library and school programs. For more information about joining this training and the Master Gardener program, please contact your local Extension Horticulture educators and program coordinators at (309) 663-8306, or visit us online at go.illinois.edu/LWM_MG by July 27. If you need a reasonable accommodation to participate in this program, please contact Brittnay Haag at (309) 663-8306 or email her at bhaag@illinois.edu. You do not have to be a gardening expert to join the program, you just have to be willing to learn and teach others. Come grow with us this fall!